In Mexican culture there is a day known as the Day of the Dead or Dia de los Muertos. On this day, people come together to celebrate the lives of loved ones who have passsed on. This is an official bank holiday in Mexico; it starts on October 31st and finishes on November 2nd. To celebrate those who have died, friends and family gather together and take gifts to the graves of the departed. Gifts include calaveras (or what we call 'sugar skull'), favourite food of the deceased and small possessions they had owned while alive. Calaveras (sugar skull) are either made out of candy or clay. The candy variety of the sugar skull is made from sugar cane. It is usually one piece of candy; it does not not have any flavouring other than sometimes vanilla. Candy sugar skulls are decorated with food colourings usually blue, yellow, green and red. On the foreheads of these skulls are the names of people who are still alive. While this is an edible candy, many chose to use it as a decorative item and dispose it after a few days. The clay variety of the calaveras is not edible, which is pretty obvious. Generally, these sugar skulls are silver and are decorated with black, white and red. These are considered more as a toy than anything. As part of the Dia de los Muertos celebrations, ladies dress up as calaveras. 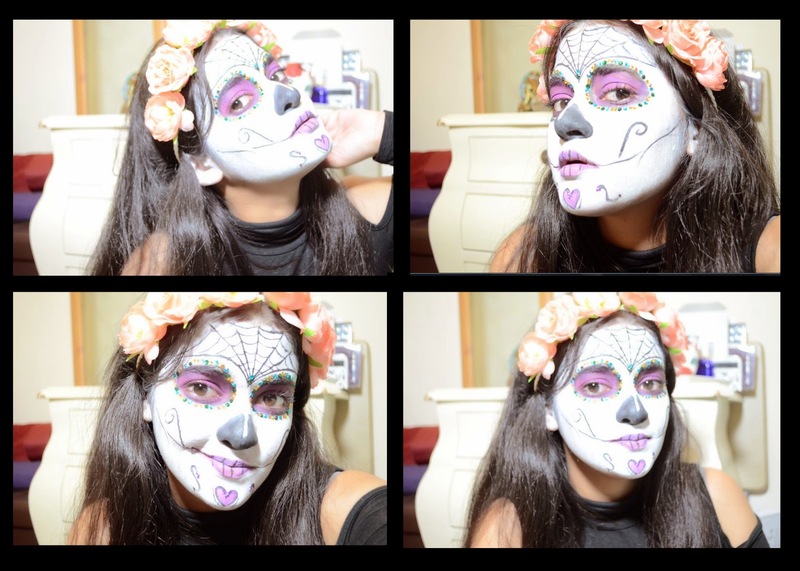 Below are some pictures of me creating a Sugar Skull look. This is perfect for Halloween.